We are so confident that you will love your Lean Tempo Production Scoreboard that if you dislike it for any reason you can return it to us for a full refund. To get the full refund the product must be returned within 45 days of order placement and the product must be in undamaged working condition. The purchase must be the company's first purchase with Lean Tempo. Before returning please reach out to support@leantempo.com to let us know what you don't like, if the issue can't be easily resolved to your satisfaction we will email you a return shipping label, so you can return it free of charge. Please return it with a copy of the original invoice or the receipt from the online store within the 45 days. Once the product is recieved with an invoice or receipt your money will be refunded. If for some reason the unit isn't performing as expected and you need repairs etc. please see the warranty page. 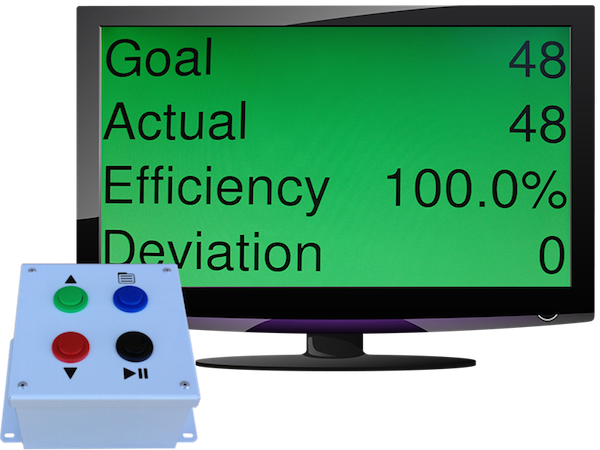 Lean Tempo Basic is a plug and play productivity tracker for only $450.